LayoutEditor / C++-Script is the buld-in scripting interface. With macro-recording you can easily get started without learn the programming interface. You have full access to the design data as well as all features to modifiy. Also you can adjust the graphical user interface of the LayoutEditor. All modifications you do with macros will immediately be displayed in the opened LayoutEditor window. 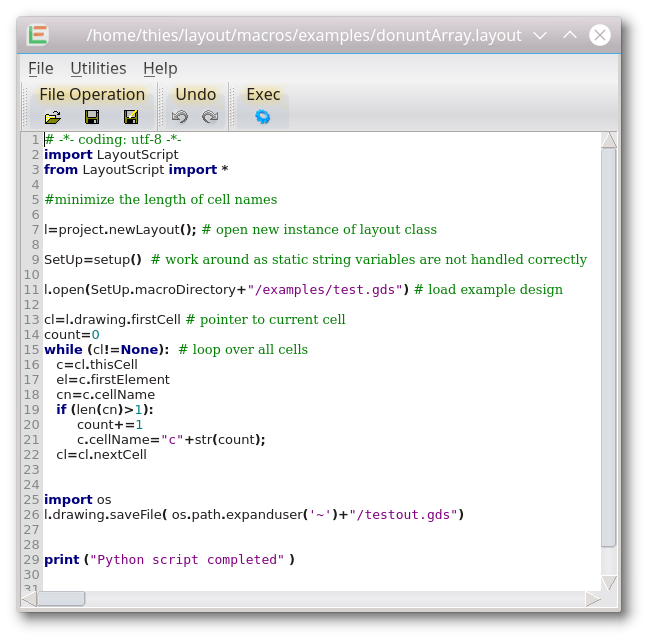 Scripting in Python is a Python extension module to open, modify and save layout and schematic designs. Python will always run in a separate instance, even if called form the main LayoutEditor application. So you always need to store the results to disk within Python and need to load it into the LayoutEditor to see the results graphical. With Scripting for Python you have access to all features to modify the layout and schematic, but cannot output the graphical display. Scrpting for Python can be combined with any other existing extension module for Python. Scripting in Ruby is identical to Scripting for Python except it is for the scripting language Ruby. Scripting is available in the full version of the LayoutEditor. With the free version without a license key storing to some file formats is limited to small designs.